Stay informed on what is biting in the Port Aransas waters. Make sure to track the Port Aransas Fishing Report provided by Deep Sea Headquarters. The Texas Gulf Coast is headquarters for world-class Texas fishing. Some of the finest fishing on the Texas Gulf Coast can be found in Port Aransas. You can choose from bay and offshore fishing, or the jetties provide an ideal location for Port Aransas fishing. Your catch may include such species as trout, redfish, flounder, red snapper, tuna, marlin or shark. Come to Port Aransas, and let one of our areas Texas fishing guides or party boats help make your fishing vacation a trip to remember. Whether you are a serious angler, or a weekend warrior, there is always great fishing in Port Aransas. 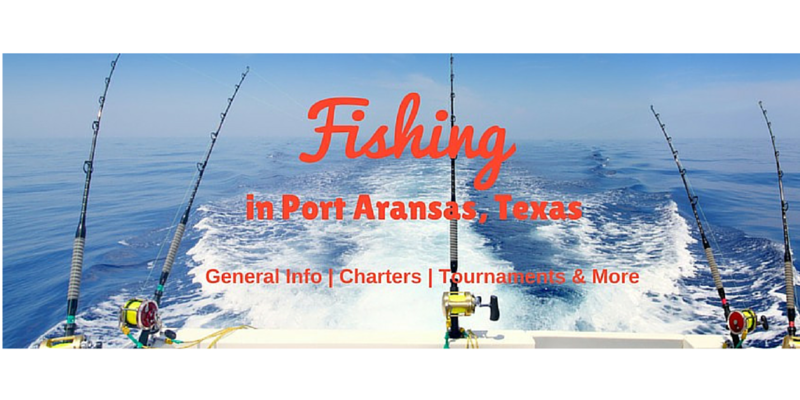 Check out some of our local Port Aransas fishing guides below! Deep Sea Headquarters offers Bay fishing trips (3 ½ hours), fishing trips from 5-12 hours as well as private charters and affordable sunset cruises. Tackle and bait is provided. The party boat, Kingfisher, accommodates groups of up to 40 people. Woody's Sports Center specializes in full- and half day private charter fishing trips. The boats accommodate one to six people for Port Aransas fishing on the bay or Gulf fishing. Bait, tackle, ice provided. Catering can be arranged. Dolphin Docks has 4 hour bay fishing trips available as well as up to 80 hour deep-water trips going out for Wahoo, Dorado, Yellowfin and Blackfin Tuna. A selection of winter fishing trips are offered as well. Captain Brent Hopkins - Bay Fishing Charters takes groups up to 5 people on Port Aransas bay fishing trips. You are asked to bring your own food and drink. Another offer are Trophy Bull Redfish Fishing Trips in Port O’Connor. This guide service also offers duck and hog hunting. Just 1 More Outfitter - Captain Frankie Eicholz guides small groups of 1-4 people on bay fishing trips. Beginners, women and children are welcome. All bait, ice, and tackle is provided. Bring your food and drinks. WaterWorld Guide Service offers bay fishing for red fish, black drum and trout. The tours are between 4-8 hours and no experience is needed. All Bait, ice and tackle is provided. Bring your food and drinks. Island Queen Inc. offers bay fishing and dolphin watch/nature cruises. Reservations required, contact Billy Gaskins for W.A.Y. program offers. Captain Ron Pierson - Private Deep Sea Charters. Private off-shore guide, not a party boat. Advance reservations required, present W.A.Y. card to receive a $50.00 discount off of the published rates! For information on upcoming events and travel in Port Aransas, Texas, register for our free enewsletter. Ready for your own fishing adventure? Check out the current vacation rental specials available in Port Aransas and book your fishing vacation today!